Now there is a story here..... but I am just not sure what it is. We are outside the Royal Arsenal in Beresford Square at what appears to be a meeting. 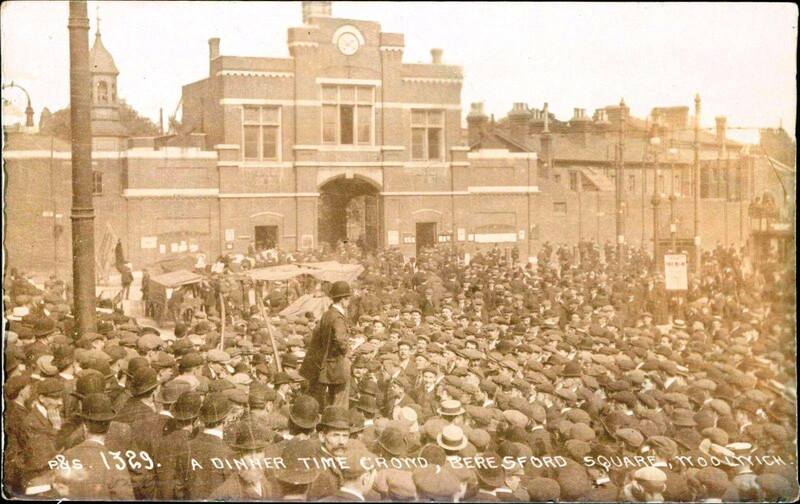 The caption on the pictures postcard just says, “A Dinner Time Crowd, Before Beresford Square, Woolwich”. I have now come across it twice, once on social media and also on Pinterrest, and I guess it will pop up elsewhere. Always careful of copyright I went looking for the company which marketed it. I know they were P&S and that our picture carried the catalogue number 1329 but so far that has led nowhere. And that is frustrating because the name might reveal the catalogue which in turn might offer up a date and context. Nor do I have the reverse side which might provide a company address, the name of the retailer and perhaps even a message with a post mark and date. So we are back to the hard way which is looking for clues in the photograph. 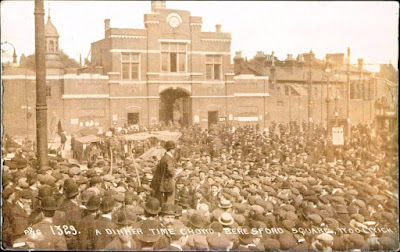 The caption refers to a “dinner time crowd " which is confirmed by the clock and given the close proximately to the Royal Arsenal I am guessing that many of those in the picture will be Arsenal workers. It is a big crowd large enough to have stopped the tram and seems to be entirely made up of men. The meeting is coming to a close and some men have already started to make their way toward the gates of the Arsenal. At present those two dates have yet to be confirmed. If it is 1914 and given that no one is wearing an overcoat we may be in the summer and possibly July or August just as the Great War is about to break out. This could suggest a peace rally or a patriotic call to action. Some trade unions were opposed to a possible war seeing it as a disaster for Europe and in particular for working people. Alternatively if the year is 1911, then this could be a meeting called to discuss the Government’s plans to reduce the workforce from 14,000 to 8,000, by directing work to private companies. Our own MP for Woolwich, Mr Will Crooks, speaking in the House of Commons observed that it “was a moral impossibility for the Government to run the Arsenal with anything like the safety with only 8,000 men [when] the Governments’ own officials had said it could not be run with any degree of certainty, with fewer than 14,000 men”, reflecting that “the Government were turning away practical workmen, and in a case of sudden emergency these men could not be replaced from the street”. 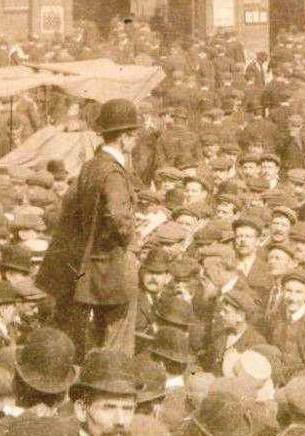 That debate occurred in the June of 1911 which fits again with what appears to be a summer’s day in Beresford Square. Of course there is a lot more research to do, but 1911 into the following year was also a high point industrial action with the Government sending troops into the Welsh coal fields, and the Manchester docks along with Royal Naval vessels to Liverpool. And today after a comment that there was a strike on July 6 1914, I went looking and yep it started after the dismissal of one man, who refused to work on the erection of a machine on a concrete foundation built by black leg builders. 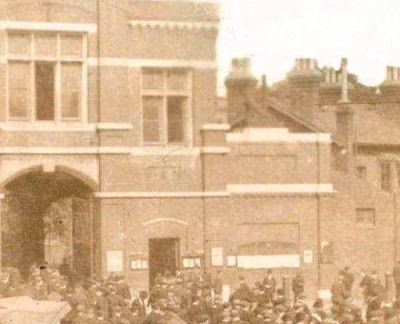 The strike quickly spread to the whole of the Royal Arsenal with the very real possibility that it would then spread beyond Woolwich. So this could be the strike, we shall have to see.